One of the ways that I save on my grocery bill, is to make salad dressing from scratch, instead if buying bottles of pre-made dressing. I favor vinaigrettes over creamy dressings, just a preference. But also, depending on the quality of oil used, vinaigrettes are often far less expensive to make than a mayo/sour cream dressing. I can take a homemade, flavored vinegar and plain salad oil, and create a fantastic salad dressing for pennies, in a few seconds. Most of the time, I mix up the dressing in the bottom of the salad bowl, just before adding the greens. It's a simple process. A bit of flavored vinegar, pinch of salt (pinch of sugar, if making a fruity dressing), salad oil and black pepper. Stir briskly, with the salad spoon, to emulsify. Pennies, just pennies! Every summer, I make several flavors of vinegar. Chive blossom, rosemary-thyme, and at least 1 berry vinegar (raspberry and blueberry having been my previous favorites). Once infused, I just keep my vinegars on the kitchen counter. They add beauty to my work space, and sit there reminding me to use them. I decorate the bottles with ribbon, raffia and sometimes labels, in part because it's just prettier, but also it helps me differentiate between each flavor with just a glance. This summer, both the blueberries and raspberries had a small crop in our gardens. But wild blackberries are everywhere in abundance. 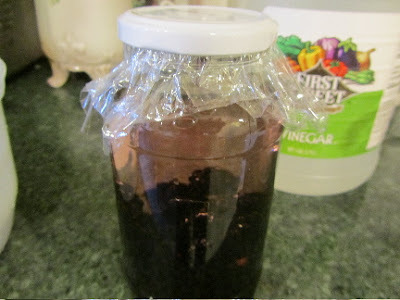 So blackberry vinegar -- here's your chance to dazzle me! Blackberry and raspberry vinegars are made with the same method, simple infusion. The proportions are 1 part raspberries or blackberries, to 2 parts white vinegar. In a sterilized 1 quart jar, place raspberries/blackberries and vinegar. Use either a plastic lid (ones from mayo and peanut butter jars seem to fit regular mouth canning jars, here in the US), or lay a small piece of plastic wrap over the opening of the canning jar, then add the ring to hold it in place. I keep the infusing vinegar in the fridge for about 4 weeks. After 4 weeks, I strain out the berries (which by now look quite bloated and unappetizing), and decant the flavored vinegar into a clean narrow-necked bottle. I like the look of a cleaned out, repurposed bottle with a cork. Packages of corks can be purchased, inexpensively, at kitchenware shops or in the cooking/kitchen section of import stores, such as Cost Plus World Market. You can, also, do as I often do, just mix a bit in the bottom of the salad bowl. Use 1 part vinegar to 2 parts oil. Add a pinch each of salt and sugar. Stir to emulsify. A typical autumn salad for our family: red and green leaf lettuce, chopped fresh pears, and sliced almonds, dressed with a berry vinaigrette. For fruit-salad dressing, I like something creamy, but with a bit of tang. Some mayo, whipped cream, and/or vanilla yogurt, and some berry vinegar. If just using mayo, I add a pinch of sugar to bring out the sweetness of the berry infused vinegar. 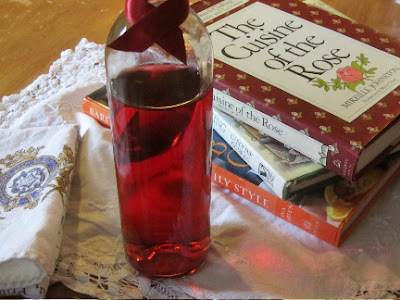 Berry vinegars make delectable marinades for chicken breasts. Make a batch of the berry vinaigrette (omit orange zest), add a tablespoon of chopped fresh rosemary, and a dash of black pepper. Pour over chicken breasts, and allow to marinate in the fridge for 30-60 minutes. Then grill to doneness. Simply delicious! I understand that berry vinegar marinades are also delicious on salmon and pork. Google "salmon" or "pork" and "raspberry vinegar", and a bunch of recipes will pop up. One last thought, it may be August, but the holidays are just around the corner. 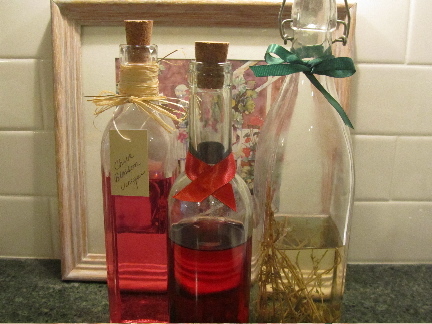 Bottles of infused vinegar make lovely gifts for the hostess, or holiday friendship gifts. Wow! Thanks for the info! How long does the infused vinegar last? I love making my own dressings. So much better to know what's going into it, and tastes much better too. After you strain out the fruit (at 4 weeks, keep it refrigerated during this time), it should keep at least a year, in a somewhat dim area, and not too hot (don't leave it a sunny window). You can also just store it in the fridge for up to 2 years. I also make herb vinegars. With those, I just leave the herbs in the vinegar, and keep on the counter. I use up a bottle of herb-infused vinegar every year, so I don't know how much longer it could last. But I will say, towards the end of the year, the herbs are beginning to fall off the stems, and it doesn't look quite as pretty, but it tastes even better than when first made. Thank you for the information! I am excited to try these ideas in my kitchen! You're very welcome! I hope you have a supply of some sort of bramble berries nearby, to try this with. Raspberries, boysenberries or blackberries would work with the same instructions. I was going to make raspberry vinegar ages ago but never got around to it - thanks for the reminder :) Rosemary/Thyme vinegar sounds great too. Raspberry vinegar is wonderful. You'll love it! I have friends who make berry vinegars with frozen fruit, and have success. So that's an option for you, if frozen would be less expensive than fresh berries. I LOVE wild blackberries. I've tried cultivated ones and they're just not the same. However, the patch that I usually pick from is sparse this year. Glad that yours are doing well. You may want to look around your area a bit, before giving up on this year's blackberries. The patch behind our house didn't do as well as another patch we know of near the highway. And a 3rd patch near the local school did fair. So, it could be the same in your area, that some patches did okay, and others not. This is totally unrelated to this post but I was wondering if you could answer a couple of questions about fruit? My family and I just bought a house last August and it came with a small orchard (4 apple trees, 4 peach trees and 1 pear tree). I have a couple of apple trees with ripe apples right now. We didn't spray for insects...partly because this is our first experience with fruit trees and partly because I am worried about the effects of the chemicals. Anyway, we have two trees full of ripe apples...one yellow and one red. The red ones don't seem to have bug bites but the yellow ones have some. Is it okay to cut off/out the bug bites and use the good part of the apple? My dad is telling me yes. He was raised in the country with a very self sufficient and frugal family and he says they did it all the time and "it didn't hurt us". However, I searched the internet and all of the articles I read say to throw apples away if there is any bites or rotten part at all. That seems like a waste but I don't want anyone to get sick. What would you do? Also, do you spray your fruit trees? If so, what do you use? I have been following your blog for about a year now and I love it! I enjoy all of your posts...from the ones about gardening and food preservation to the ones on how to save electricity. Your 'can do' attitude inspires me. It's the attitude I strive for and strive to teach my two sons. I always look forward to your next post. First of all, I'm not an expert, but I'll tell you how I handle blemished or infested fruit. I wouldn't eat rotten fruit, simply because I think it would have an off taste, and it's not a good idea to eat decomposing matter, which rotten fruit is on its way to becoming. Those fruits I'd compost. Fruit that I picked off the tree myself (not scooped off the ground) -- if it has worm trails, or even a worm in it, I cut off that portion, and we use it right away. I figure it's better to eat non-pesticide sprayed fruit that may have a bug in it, than to eat pesticides. Fruit on the ground is another story. If I think the wind blew an apple off the tree (branches get blown around, crossed, and sometimes an apple or two fall, if they're near ripe), or a squirrel or person knocked it off, and it's within 24 hours (I check the apples daily near harvest), and there are no obvious critter bites, I wash it off very well, and cut out bruises and use right away. Any fruit laying on the ground, that I am unsure of, I do compost. I worry more about rodent contamination than bugs, and bacteria in the soil that could contaminate the fruit. I would definitely not recommend eating an apple that looked like a rat, mouse or squirrel had nibbled on it. Don't try to store fallen fruit, or any fruit with insect infestation, bruises or cuts. They'll go bad and ruin fruit next to it. For the most part, the bugs that feed on fruit are not the same as bugs that could live in a human. There is a parasite in tropical locations (rat lungworm larvae) that is transmitted through a type of slug that climbs the trunk of fruit trees (papaya, mostly), and deposits this larvae on the skin of the fruit. This parasite does die inside the human, and most people have mild symptoms. Humans are considered an incidental host to this larvae, and not one the larvae seeks out. But again, this is a tropical pest (Hawaii, I believe). I have not heard of a problem with a parasitic pest in fruit trees in my region. Some cultivars are more susceptible to infestations than others, and it can vary from one year to the next. I tried to plant resistant cultivars, but occasionally have a worm or disease problem with one of the trees. We don't spray. I've used sticky traps, and I clean up under bushes and trees and compost all contaminated fruit, far away from the trees.I keep leaves raked up throughout the season. I have considered introducing predator control in one of our trees. When an insect becomes problematic, it's due to lack of natural predators for that particular insect, in the area, and poor management of the orchard (not cleaning up fallen fruit and leaves). We wash our fruit well, in safe drinking water, before eating. When I'm deciding how to store our fruit, I set aside any pieces that I think need using right away (apples or pears that fall as I'm picking, or any with blemishes, as they'll go bad quickly), and I store the rest. Commercial orchards spray in part to keep their trees from developing disease, so they will continue to be productive for many years, and also, because they're selling fruit to a public that insists on perfect-looking fruit. I think spraying is just the easier way to control problems. There are methods for minimizing diseases in your trees that don't involve spraying with harsh chemicals, such as cutting out infected branches, spraying with an oil/soap spray, cleaning up under trees, both fallen fruit and leaves, on a regular basis, and pruning branches so that air circulates. I have read that you can lay a breathable ground cover over the soil beneath a tree, in late fall. Secure it tightly all around the edges, and the larvae which hatches from eggs in fallen fruit can't escape to reach the next year's fruit. I haven't tried this but am considering it for our one problematic tree (a cherry tree). I think there are many old-timer ways to grow good fruit, but they do take diligence. Your county agricultural extension office should be able to tell you what type of pests are prevalent in your area, and how to control them naturally. Some pests can be controlled with natural sprays, such as peppermint oil, or dish soap and cooking oil, or hot pepper in water. You can make these sprays at home, allowing you to know exactly what is in what you're spraying. University extension offices can offer a lot of helpful advice. Good luck! Let me know what you decide to do about eating your fruit. I like the idea of using natural sprays. I use Kirk's Castile bar soap to do laundry (finely grated and combined with Borax/A&H Washing Soda. I was perusing the Kirk's website today and they have a recipe section. It mentioned using their natural castile soap as a pesticide spray for gardens. I might try that next year along with some of the other ones you mentioned. Glad to help, Angie! I hope your orchard proves to be very productive in the coming years! I may try this with mulberries. I already make a dressing with mulberry juice mixed with rice vinegar, but this sounds interesting. I've never tasted mulberries before. Dressing with mulberry juice and rice vinegar does sound delicious! Great job finding ways to use your mulberries! I look forward to trying this! I like every fruit and berry flavoured salad dressing, but the stores only sell raspberry vinaigrette. So this will give me some variety. I'm now curious just what other kinds of fruit I can use to infuse vinegar. I have a crabapple tree that I may use some crabapples from, to try this too. If it works, then I could use the crabapple vinegar in place of apple cider vinegar, in recipes. Hope you enjoy yours!